You didn't know Gangs regularly Hold Dance-Offs? West Side Story 1961 - 151 min. 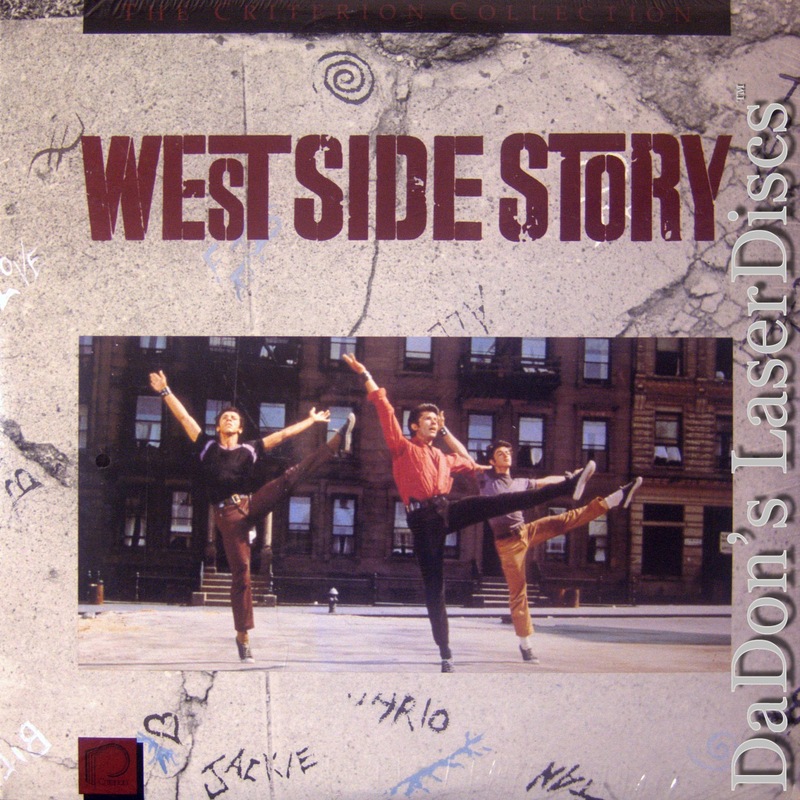 - Color Genre: Musical LaserDisc Movie Storyline: Considered one of the most popular musicals of all time, WEST SIDE STORY earned director Robert Wise an Oscar for Best Director as well as nine other Academy Awards, including Best Picture. Realistically portrayed characters and their surroundings and expert editing complementing innovative dance sequences mark this highly stylized modern-day Romeo and Juliet tale. The stage is set in New York's Upper West Side in the 1950s, where the area's slums are plagued by racial tensions acted on by two rival gangs: the Puerto Rican Sharks and the Caucasian Jets. In the middle of this mess is young, innocent Maria (Natalie Wood), a Puerto Rican seamstress whose brother, Bernardo (George Chakiris), is the leader of the Sharks. Despite the warnings of Anita (Rita Moreno), Bernardo's fiery girlfriend, Maria falls in love with a young, hopeful Polish boy, Tony (Richard Beymer), who used to belong to the Jets, now headed by Riff (Russ Tamblyn). When Tony, on Maria's urging, tries to stop a rumble between the gangs, tragedy ensues, marking their dedicated love affair with violence and desperation. The infectious, lyrical landmark score by Leonard Bernstein and Stephen Sondheim help round out one of the greatest musical experiences ever captured on film. LaserDisc Movie Review: Romeo and Juliet is updated to the tenements of New York City in this Oscar-winning musical landmark. Adapted by Ernest Lehman from the Broadway production, the movie opens with an overhead shot of Manhattan, an effect that director Robert Wise would repeat over the Alps in The Sound of Music four years later. We are introduced to two rival street gangs: The Jets, second-generation American teens, and the Sharks, Puerto Rican immigrants. When the war between the Jets and Sharks reaches a fever pitch, Jets leader Riff (Russ Tamblyn) decides to challenge the Sharks to one last "winner take all" rumble. He decides to meet Sharks leader Bernardo (George Chakiris) for a war council at a gymnasium dance; to bolster his argument, Riff wants his old pal Tony (Richard Beymer), the cofounder of the Jets, to come along. But Tony has set his sights on vistas beyond the neighborhood and has fallen in love with Bernardo's sister Maria (Natalie Wood), a love that, as in Romeo and Juliet, will eventually end in tragedy. In contrast to the usual slash-and-burn policy of Hollywood musical adaptations, all the songs written by Leonard Bernstein and Stephen Sondheim for the original Broadway production of West Side Story were retained for the film version, although some alterations were made to appease the Hollywood censors (especially in the lyrics of "Gee, Officer Krupke"), and the original order of two songs was reversed for stronger dramatic impact. The movie more than retains the original choreography of Jerome Robbins, which is recreated is some of the most startling and balletic dance sequences ever recorded on film. West Side Story won an almost-record 10 Oscars, including Best Picture, supporting awards to Chakiris and Rita Moreno as Bernardo's sister Anita, and Best Director to Robbins and Wise. Natalie Wood's singing was dubbed by Marni Nixon, who also dubbed Audrey Hepburn in My Fair Lady; the film's New York tenement locations were later razed to make room for Lincoln Center. --- Hal Erickson West Side Story is remarkable for its seamless transference from stage musical to screen classic, with the complete Leonard Bernstein/Stephen Sondheim song score intact, as well as the choreography of Jerome Robbins. The story, derived from Romeo and Juliet, works on an symbolic rather than realistic level: there is no pretense that this is a true representation of what New York City gangs were like circa 1960. Veteran director Robert Wise is probably the person most responsible for the film's success, and for retaining the best qualities of the stage production, though co-director Robbins, who feuded with Wise throughout the production, would likely disagree. After several weeks of delayed production due to Robbins' insistence on extra rehearsals, Wise tired of the Broadway legend and had him removed from the set. West Side Story swept the Oscars, taking ten awards, including awards for Best Picture and its decidedly non-cordial co-directors. The Academy gave a special choreography award to Robbins, who thanked a great many people in his acceptance speech, noticeably failing to mention Wise. --- Richard Gilliam Thanks for Visiting DaDon's Rare LaserDiscs ! Reviews, Articles, Newsletter and Information for Movies on LaserDisc LD Laser Disc, LazerDisc.